Cooking is all about taste and science! It’s pretty amazing how combining a few simple ingredients can create such flavorful dishes. This couldn’t happen without a little (or a lot of) science! By now I am sure everyone knows that baking soda or sodium bicarbonate (NaHCO3) reacts with an acid like vinegar (which is about 5% acetic acid or CH3COOH) to form carbon dioxide (CO2). When used in baking, this allows your baked goods to rise. When I am add ingredients for a recipe to a bowl, I always make sure I add the vinegar on top of the baking soda so that I can watch the bubbles form! It’s like an edible volcano science fair experiment! 🙂 Be sure to left your children watch science at work in the kitchen! This recipe for Shamrock Cupcakes also has another pretty neat science experiment going on. These cupcakes are a beautiful deep green color and it doesn’t come from food coloring or spinach! The green comes from the reaction of the baking soda and chlorogenic acid found in the sunflower seeds. Pretty neat, huh!? Baking soda & vinegar = BUBBLES! So whether you like science or good food, you will LOVE this recipe! These cupcakes make the perfect treat for your kids to take to school because they are delicious, NUT-FREE, Dairy-Free, and they are REALLY Easy to make! The key to making these cupcakes nut-free AND green is the sunflower seed butter. Surprisingly, sunflower seed butter taste very similar to peanut butter, more so than almond butter does. You can purchase sunflower seed butter online or in the store (most Walmarts carry it). You can also order raw sunflower seeds and make your own butter. I prefer to make my own since it is SO much cheaper! I followed a similar method to THIS one to turn sunflower seeds in to a yummy smooth butter. I did toast my seeds a little longer in the oven, and I used my Magic Bullet instead of a food processor. You could also use a Vitamix blender. In any of my other recipes, you can always substitute finely ground raw sunflower seeds in the place of almond flour to make any recipe nut-free. I haven’t done this for every recipes but for the ones that I have tried, it worked great! All I can say is EASY! This recipe is a modified version of my Elvis Cupcakes. If you are not looking for nut-free or green cupcakes, be sure to check out this yummy recipe. No fancy flours needed and everyone will LOVE them, Elvis Fans or not! Feel free to make these Shamrock Cupcakes into mini cupcakes, especially if sending them to school with your child. Mini cupcakes are just too cute and there is less waste if the picky kid in the class doesn’t want to eat them. It also saves you $$$ because you can get twice the amount of cupcakes out of a batch.. Use this mini cupcake pan and liners along with a 1-1/2 tbsp. scoop (I LOVE MY SCOOPS) and bake for 8-10 minutes or until a toothpick inserted in the center comes out clean. Be sure not to over bake! The chocolate chips are not required but boost the flavor or these green jewels! Looking for another St. Patrick’s Day recipe?? Check out my Irish Soda Bread. It’s delicious! Also check out this roundup of other grain-free St. Patrick’s Day recipes. Feel free to turn any of my other bread or baked goods green for St. Patty’s Day by switching the almond flour for ground sunflower seeds. I hope everyone enjoys these cupcakes and Happy St. Patrick’s Day to you! To print recipe, highlight recipe and right click and select print. Preheat oven to 350 degrees F. Add all ingredients to a medium bowl and blend well with hand mixer. Taste for sweetness and adjust if needed. Using a scant large scoop (a little less than 1/4 cup), divide batter into 8 cupcake liners. Bake for 14-16 minutes or until toothpick inserted in the center comes out clean. DO NOT OVER BAKE! Cool on wire rack. *Sweeteners: I used Organic KAL Stevia to sweeten this recipe. If just switching to this kind of stevia, please use a little less than the recipe calls for and then taste to see if more is needed or if you would like to supplement the sweetness with another form such as raw honey, organic coconut sugar or a sugar alcohol such as xylitol. If using Organic Sweet Leaf Stevia,use twice the amount as the recipe calls for of KAL Stevia (this seems to be the right ratio for all the recipes I have tried so far). Everyone’s pallet will respond differently to the taste of stevia and the last thing you want to do is add too much and make your recipe bitter. Remember, you can use ANY sweetener you like in ALL of my recipes. For this recipe, I recommend a granular sweetener like coconut sugar vs. a liquid sweetener like honey so that the liquid ratio is not affected. Nutrition based on 8 cupcakes: 160 Calories, 12 grams Fat, 10 Total Carbs, 2.5 grams Fiber, 7.5 NET CARBS, 6 grams Protein (using banana and chocolate chips). Carb count will be lower if using applesauce and if you omit the chocolate chips. Would you say about 2 tbsp of coconut sugar would be a sufficient amount? Are these light and fluffy, or more dense? My daughter’s class is eating green bagels and cream cheese on Monday, and I’ll need to send a dye and gluten free alternative. These are perfect, just wondering if they are dense enough to be made in a bagel pan. Thoughts? Sarah, I think this batter will work PERFECTLY in a bagel pan. I wouldn’t call it dense but it is VERY sturdy… almost spongy. Please take pictures and post, I’d love to see a green bagel too! 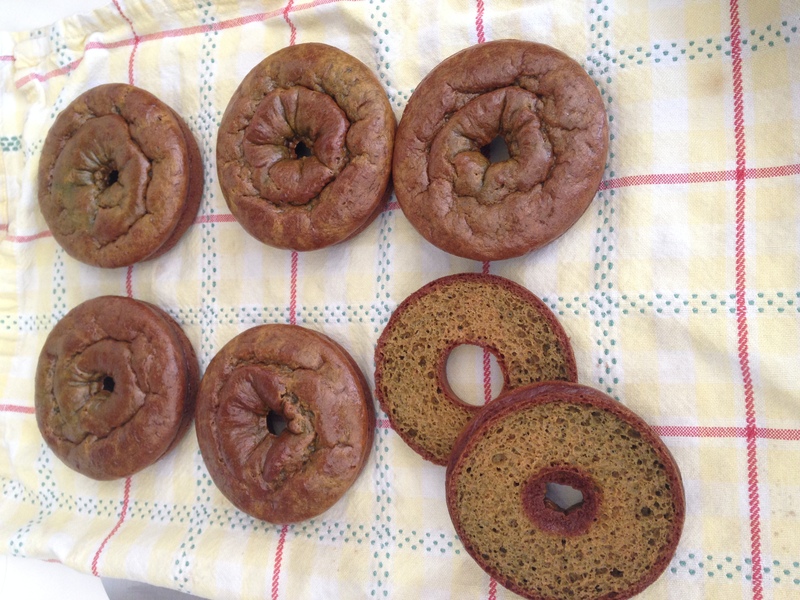 I need to get a bagel pan… thanks for the suggestion! Success! I was a little skeptical at first because when they were hot, they weren’t green at all. A little patience until they cooled paid off though, because now they are a lovely dark green. 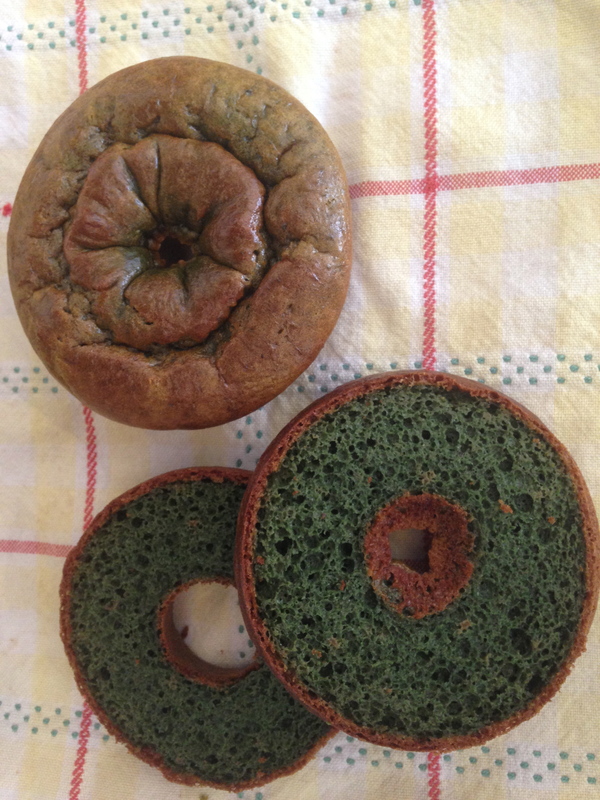 I made some green butter with a natural food dye and we had an early St. Patrick’s Day breakfast. Thank you so much for this!! !